The Philippines has a workforce that is consistently ranked as among the very best in Asia. Filipino Workers are considered the new breed of world-class service professionals and are referred to as Global Knowledge Workers because of their high level of proficiency in English and fast learning curve. The Philippines is also the world’s best country in business english according to the 2012 study by Global English Corporation. A pro-business, pro-investor government welcomes the opportunity to create jobs and boost economic growth through investment in information technology and other progressive sectors. Basic rights of investors are guaranteed (right to remit profits and pay foreign obligations, right to repatriate investments). Substantial financial incentives are available to investors through the Board of Investment and the Philippine Economic Zone Authority, including tax holidays and duty-free importation of capital equipment. The Philippines provides a comfortable and friendly second home to Expatriates. Within close proximity are modern housing subdivisions, international schools, best recreational facilities such as golf courses and driving ranges, and world–class health care services. A central Asian location, making travel among Asia’s most exotic and fascinating destinations affordable to most in terms of investment as well as time. Why choose Science Park of the Philippines, Inc. (SPPI)? SPPI is highly regarded as a pioneer and leader in private industrial estate development in the country. The largest hectarage of industrial estates developed, and being developed totaling to about 800 hectares. Established in 1989 ,SPPI has gained the reputation of being a cutting edge developer in industrial estates through its Light Industry & Science Park projects. The first among major privately owned industrial estates to secure conversion of its land to industrial status under the government’s Comprehensive Agrarian Reform Program. The first to introduce the concept of a centralized waste water treatment plant in each of its industrial parks. The centralized waste water treatment plant has now become a requirement of PEZA that all approved industrial estates setup such a facility. The first privately owned industrial estate to be granted approval to operate a Special Export Processing Zone. The first privately owned industrial estate to be registered with the Board of Investments. The first to build an interchange linking a national expressway with a privately owned industrial estate. The first privately owned industrial estate to be granted approval to operate as a Special Economic Zone by the Philippine Economic Zone Authority. 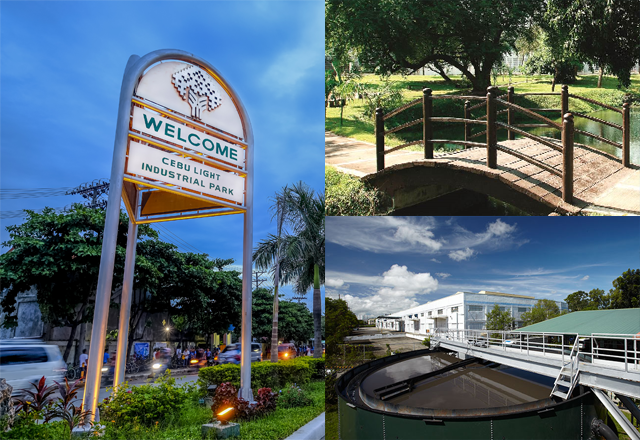 The first privately owned industrial estate in the Philippines to be certified ISO 9001 for Quality Management System, ISO 14001 for Environmental Management System, and OHSAS 18001 for Occupational Health and Safety Management System. The first industrial estate to receive a Special Recognition from the Environmental Management Bureau of the Department of Environment and Natural Resources and the Philippine Association of Environmental Assessment Professionals for its achievement in environmental impact assessment as a result of its leadership in environmental management and pollution control. The first industrial estate to receive a special citation from the Personnel Management Association of the Philippines for its concern for the environment. The first Oscar Escobar awardee for air quality management as awarded by the Concerned Citizens Against Pollution. The first to have won, for three consecutive years (1997-1999), Best Community Project by the Philippine Economic Zone Authority in recognition of its exemplary activities in social and community development in the areas around its projects. Why locate in SPPI's industrial park? Strategic location – All of SPPI’s industrial estates are located near expressways, highways and important points of destination such as international airport and seaport, residential, commercial and leisure facilities. Managed environment – SPPI is acknowledged to have a strong onsite management team to give locators personalized assistance on a wide range of business concerns. Who are the locators in our industrial parks? The industrial parks of SPPI are home to Fortune 500 companies and major multinational companies including Procter & Gamble, Pepsi, NEC, NXP and ST Microelectronics (both formerly Philips Electronics), First Sumiden, H.B. Fuller, Nippon Paint, Continental Temic and Sumitomo Wiring Systems, to name a few, and top Filipino export and manufacturing corporations such as Concepcion Industries and Ionics Inc.
Science Park of the Philippines, Inc. (SPPI) was established in 1989 and, through the years, has gained the reputation of being a cutting edge developer of industrial estates through its Light Industry & Science Park projects.